Marine conservationists from the University of British Columbia, Zoological Society of London (ZSL), and John G. Shedd Aquarium, Chicago today launched a smartphone app that could lead to new discoveries about some of the ocean’s most mysterious and threatened animals — seahorses — and pave the way for similar efforts with other difficult-to-study species. “We’ve made important scientific breakthroughs with seahorses in recent years, but they remain incredibly enigmatic animals,” says Amanda Vincent, director of Project Seahorse, UBC and ZSL’s joint marine conservation initiative. Thanks to their small size and ability to blend into their surroundings, seahorses are difficult to study in the wild. Of the 48 seahorse species listed on the IUCN Red List of Threatened Species, 26 are considered ‘Data Deficient’—meaning that there isn’t enough information for us to know whether these species are thriving, disappearing, or something in between. “We know that seahorses are threatened by overfishing, destructive fishing practices, and habitat loss. Now we need to pinpoint populations and places that most need conservation action,” says Heather Koldewey, co-founder of Project Seahorse and Head of Global Conservation Programmes at ZSL.The app and its feature-rich companion website, www.iSeahorse.org, represent a pilot collaboration with iNaturalist.org, a leading citizen science group. 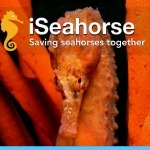 The iSeahorse iPhone app is available for download here. To learn more about iSeahorse and explore seahorse maps, species profiles, and other data, visit www.iseahorse.org. A picture of the new app can be downloaded from here. “By leveraging the enthusiasm of everyone from fishers to SCUBA divers to people on vacations at the beach, we’ll create a more comprehensive picture of seahorse populations around the world. This in turn will inspire new scientific research and practical conservation measures that can help protect ocean habitats,” says Chuck Knapp, vice president of Conservation and Research and Louis Family Foundation Conservation Chair for the Daniel P. Haerther Center for Conservation and Research at Shedd. “With iSeahorse, we’ve created a suite of citizen science and conservation tools that can be readily adopted by other groups for other difficult-to-study species,” says Scott Loarie, co-director of iNaturalist.org. Approximately 13 million seahorses are traded globally, live and dead, every year around the world. They are used in traditional Chinese medicine, for display in aquariums, and as curios and souvenirs. These tiny sentinels of the sea thrive in healthy habitats: conserving seahorses helps protect the oceans for all of us who depend on them. Of the 48 seahorse species on the IUCN Red List of Threatened Species, 11 are listed as threatened. Twenty-six species are listed as Data Deficient, which means that we do not have enough information to confirm their conservation status. Many seahorse species appear to mate for life. Where seahorses are monogamous, their pair-bonds are reinforced by daily greetings, during which the female and male change colour and promenade and pirouette together. The dance lasts several minutes, and then the pair separates for the rest of the day. Anyone, from divers to fishers, scientists to people on beach vacations can use the app to upload photos and observations to iSeahorse. These citizen scientists can help identify seahorse species and even advocate for their protection in their ocean neighbourhoods. Scientists from Project Seahorse and seahorse experts around the world will use this vital information to better understand seahorse behaviour, species ranges, and the threats seahorses face. They will use this knowledge to improve seahorse conservation across the globe. iSeahorse is made possible by the generous support of Guylian Belgian Chocolate, Harmsworth Trust UK, and Whitley Fund for Nature. Project Seahorse is a marine conservation group based at the University of British Columbia, Canada, and Zoological Society of London. Recognized by the IUCN as the global authority on seahorses and their relatives, Project Seahorse works to protect seahorses in order to support ocean conservation more broadly, generating cutting-edge research and using it to inform highly effective conservation interventions. Led by Prof. Amanda Vincent and Heather Koldewey, both global experts on seahorse conservation, Project Seahorse has won many international awards and honours, and works in collaboration with researchers, governments, conservation groups and local communities worldwide. The world’s leading expert on seahorses, Prof. Vincent first uncovered the thriving global seahorse trade in the mid-1990s and co-founded Project Seahorse in response. Project Seahorse researchers were the first to study seahorses in the wild and the first to identify the scope of the threats they face from overfishing and trade. As the IUCN Specialist Group for seahorses and their relatives, we have produced a large proportion of the world’s research on these fishes, approved global conservation assessments, chaired a working group for an international trade accord, provided expert advice to the world’s definitive fish database, and advised public aquarium and aquaculture ventures internationally. The team’s efforts have resulted in the Convention on Trade in Endangered Species (CITES) adopting international trade controls for seahorses in 2002. Founded in 1826, the Zoological Society of London (ZSL) is an international scientific, conservation and educational charity whose mission is to promote and achieve the worldwide conservation of animals and their habitats. ZSL’s mission is realised through our groundbreaking science, its active conservation projects in more than 50 countries and our two zoos, ZSL London Zoo and ZSL Whipsnade Zoo. The John G. Shedd Aquarium, a nonprofit organization dedicated to public education and conservation, is among one of the world’s largest indoor aquariums. The facility houses over 32,500 aquatic animals representing some 1,500 species of fishes, reptiles, amphibians, invertebrates, birds and mammals from waters around the world. Beautifully situated on the shores of Lake Michigan, Shedd Aquarium is known as “The World’s Aquarium.” Since its opening in 1930, the aquarium’s mission has been to enhance public understanding and appreciation of the aquatic world. The Daniel P. Haerther Center for Conservation and Research at Shedd is committed to conserving species and ecosystems through research that advances understanding, informs policy and enhances livelihoods. A longtime supporter and partner of Project Seahorse, Shedd currently works with them in Southeast Asia to build local capacity for monitoring and managing seahorse populations.